Gladys S. Leggett was born in Tallahassee, Florida to Deacon & Mother J.P. Sloan on February 8, 1920. Mother Leggett lived a fulfilling, courageous, and impactful life where she served God, her family and community. She was a retiree of Publix, a Life Golden Heritage member-NAACP, Lakeland Chapter NAACP, Heroines of Jericho, Coleman Bush Boosters, Polk County Voters League, & the Gladys Leggett Neighborhood Association. She was a volunteer for Meals on Wheels, a Voting Precinct Captain, Voting Registrar, Democratic Women, & Black Democratic Caucus. She grew up at St. Luke Freewill Baptist Church and graduated from Washington Park High School. 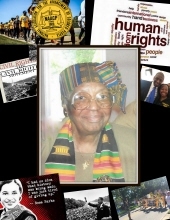 Her achievements as a civil rights worker, warrior for justice and human rights were too numerous to mention. She is preceded in death by her parents; daughter, Debra Curtis, son, Charles Silas, and husband, Robert Leggett. She leaves a lifetime legacy of love and memories to her son, James Sunny Silas, like a sister, Jane Cason & Ernestine Davis; extended family, like a son, Carlton Brown, a God-son, Don Brown (Bernice), Rebecca Thomas, Betty Porter, Erma Willis, Doris Moore Bailey, Mary Johnson, & Joe Garvin, a host of nieces, nephews, & cousins. To send flowers or a remembrance gift to the family of Gladys S Leggett, please visit our Tribute Store. "Email Address" would like to share the life celebration of Gladys S Leggett. Click on the "link" to go to share a favorite memory or leave a condolence message for the family.